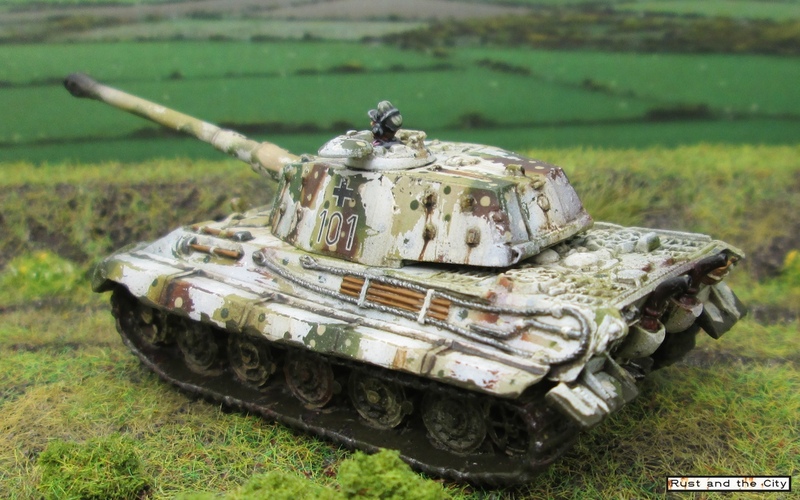 I painted the winter whitewash in the same way as the Panthers and T-34s I posted previously. 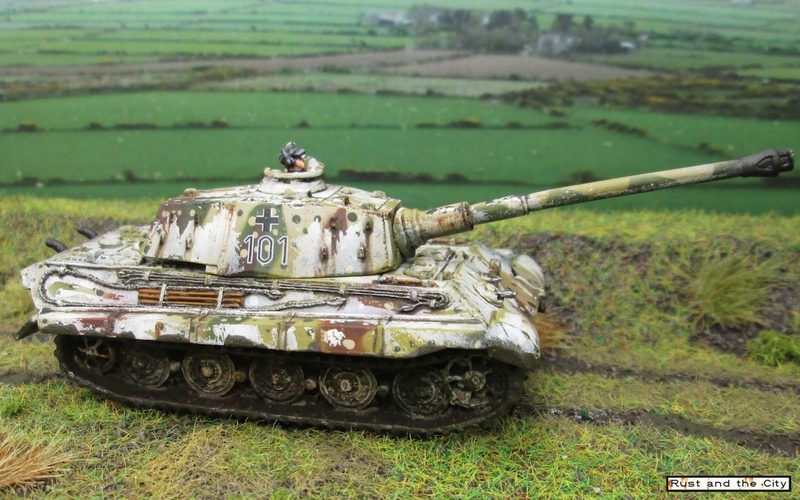 I have some step-by-step pictures from the Panthers that I have been meaning to write up as a tutorial for winter whitewash. 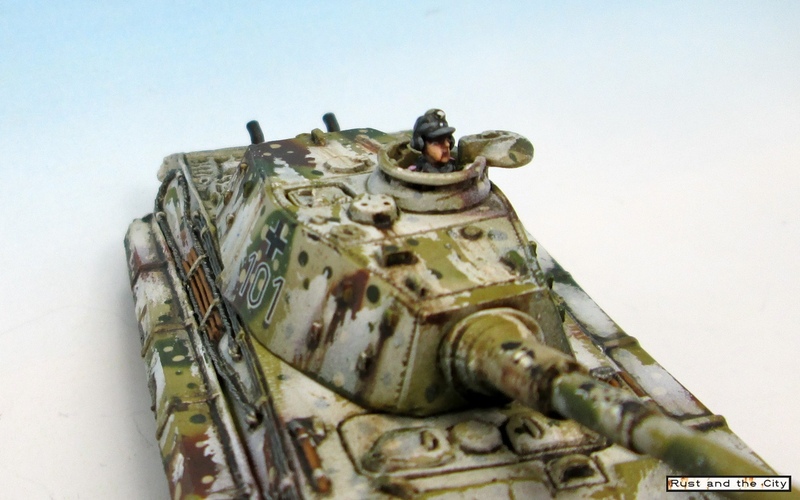 I used whitewash and the airbrush and it is fairly easy to get nice results. I tried to airbrush some of the sections quite lightly so you can still see the ambush pattern through the whitewash. I’d really like to try whitewash with oil paints in the same way as I do the dirty streaks. I think it would be a lot of work though and might just look messy. Before whitewash. Dots are a little large but they show well through the whitewash. In games, I always am drawn to playing with big, expensive models like Tiger and King Tigers because they are so iconic. I haven’t played with them though because they are so many points. I always feel like I need larger tank platoons so I can assault infantry effectively and can’t make lists I am happy with when they also contain King Tigers. For myself, I can’t see how I could really win attacking infantry with a King Tiger in a tank company. I feel like they might be more effective in an infantry company on defence than in a tank company that has to attack. I’ve played against King Tigers a few times recently. Their big guns and high front armour make them a problem against my Sherman company. My smoke from the heavy mortars and direct fire smoke can be quite effective at negating them. It can be pretty frustrating trying to chase them down to get a side shot though. In my last game I kept the King Tiger from firing all game until it got two concealed shots through smoke in defensive fire and destroyed my assaulting tanks, winning the game for the other player! 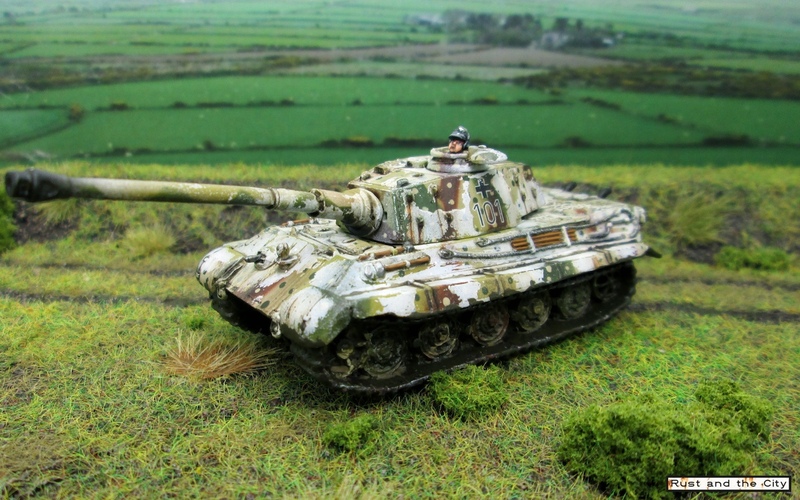 My King Tiger pet peeve has to be when they back up into a corner of the board where I cannot possibly get a side shot. 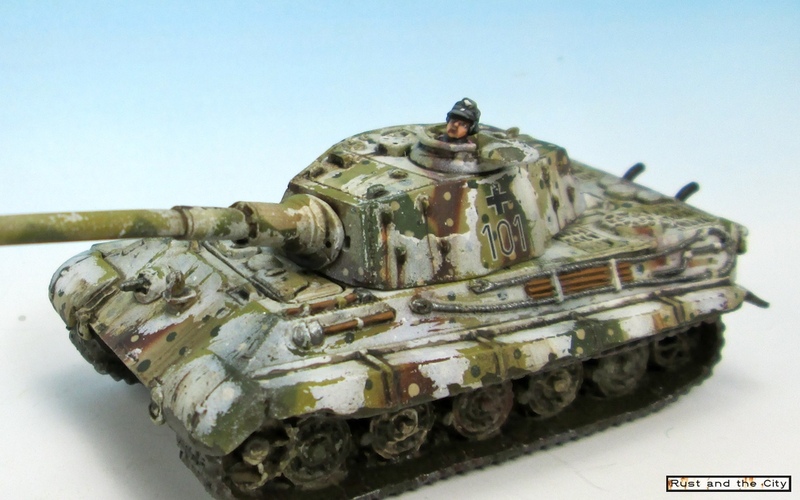 I hope you enjoyed seeing this model and reading my thoughts on the use of King Tigers. 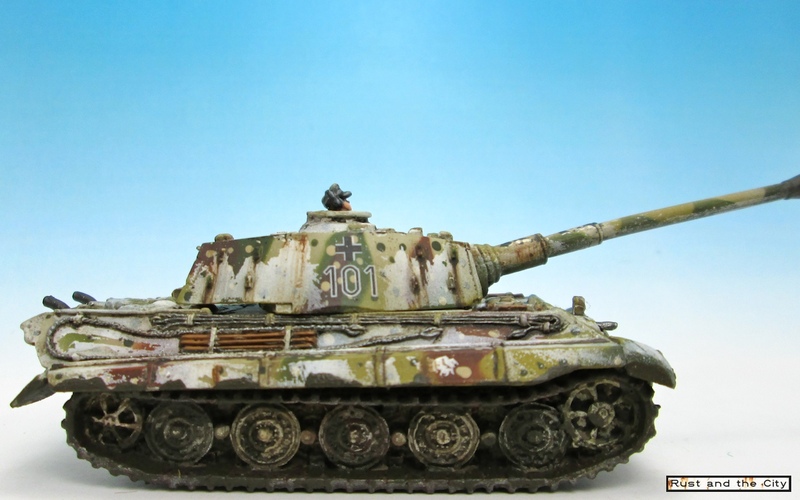 I’d love to hear how other people have played with and against King Tigers. I’ll finish off that whitewash tutorial and post it up in the next week or so. As always, comments and constructive criticism are greatly appreciated! The camo looks great, well worn but not "busy". My one critique would be the barrel pointing up in the air, I notice the other KT was the same way. Other than the one picture I have seen of King Tigers on parade I don't know why a tank would ever have it's gun elevated that high. Unless it's commanded by Carius and he is shooting down fighter bombers. Hmmm, good point on the barrels. These barrels are tricky to assemble as they are metal and so heavy. I just set them up so that they had the maximum contact area for gluing. I looked up some pictures of King Tigers. It seems that their barrels can elevate up to 17 degrees. 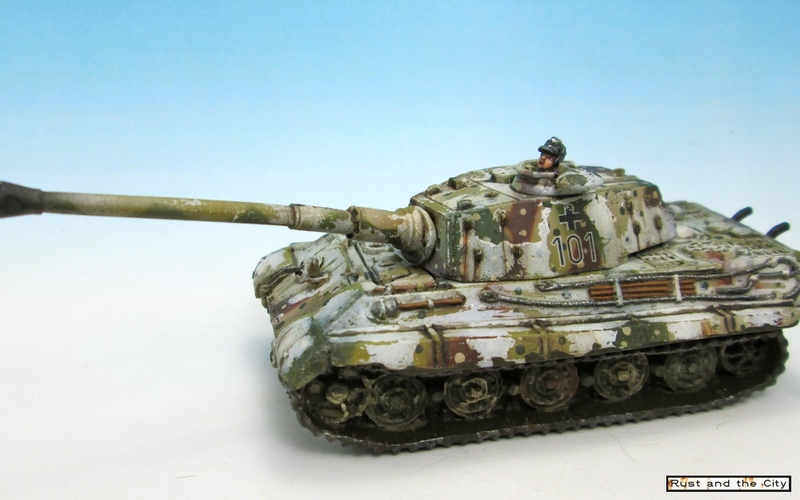 Some of the pictures I saw on google images showed King Tigers with the barrels pretty elevated. I'm guessing that while shooting in combat they would be lower though. Really nice, a good balance between whitewash and the underlying camo. 2nd the gun barrel thing, and hit up the tow cable and shovel to darken it a little bit, but these are minor nitpicks. Great work. Thanks for the feedback. Unfortunately the models have already gone out so no chance to make more changes. 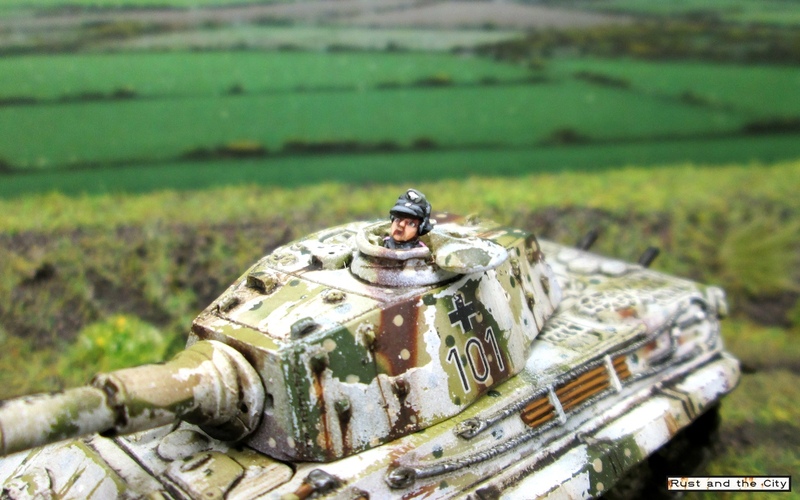 Mate, I love the look of your axis tanks - they really knew how to build pretty thing, didn't they?! Thanks Drax. They definitely have a lot of interesting tanks.